Being president of a Central Asian country is a tiresome task, but apparently leaves one time for a hobby. A new video shows the president of Turkmenistan signing his latest in Turkmen, English and (pseudo) German. Gurbanguly Malikgulevich Berdimuhamedov is an avid songwriter and performer, who usually shares the stage with his grandson Kerimguly. The family duet was shown last week by state media performing their latest creation, a melodic song about the beauty of Turkmenistan sung in three languages. Playing the tune on a white Yamaha grand piano, the three-time leader of the country sang in Turkmen, English and in what seems to be German, though it was hard to be sure. Some German words can clearly be heard in a flow of other, unrecognized sounds. 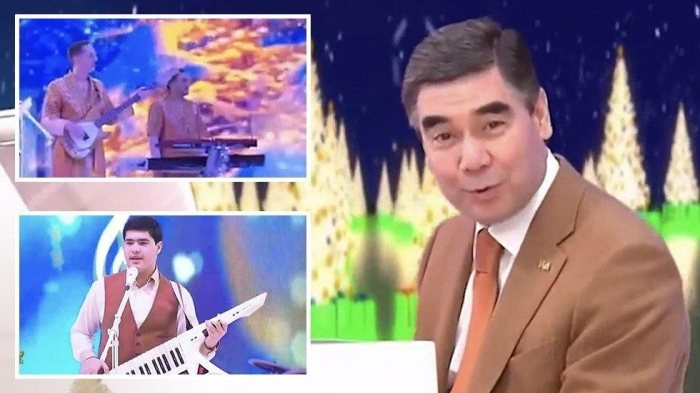 What’s even more amusing is that the opposition newspaper Chronicles of Turkmenistan trolled the president in a video of their own, published on YouTube. After the second minute, where Berdimuhamedov is attempting to sing in German, a photo of German Chancellor Angela Merkel briefly stuns the viewers.